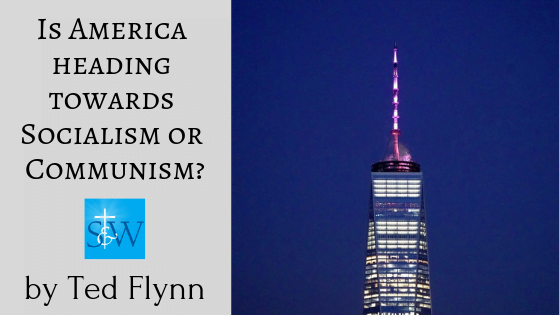 Is America Heading Towards Socialism or Communism? We all know the story of the frog being dropped into a pot of water, and gradually turning up the heat until the frog boils to death. As a people, we have grown so immune to sin, we all have to a degree become the frog. There is progressivism, socialism, Marxism, Stalinism, Leninism, Maoism, communism, and so forth. All of these ideologies mean different things, but Maoism, Leninism, and Stalinism are very similar due to the wide spread death associated with the introduction of the philosophy. Marxism is about redistribution of assets. God can exist in Marxism, but not in communist rule. Communism does not necessarily have to be violent, but God must be removed under communism. In the great classic film Doctor Zhivago, (book by Boris Pasternak), Yuri goes back to his home after being away from Moscow during the onset of the Bolshevik Revolution, and finds people have been assigned rooms in his residence by order of the new government. The redistribution of assets is a form of class warfare that ultimately ends in violence. It is about taking from one and giving to another and to those considered less fortunate, and sanctioned by the civil authority in control. A long-term agenda of socialism will lead to communism. Communism does not need to be violent, but it is simply a social doctrine without God, where the STATE is supreme. 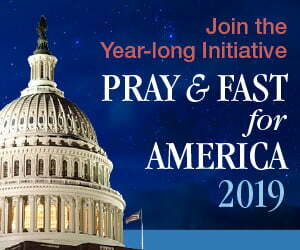 There is no room for Christianity in a communist government. Socialism is the slow calculated movement to a godless form of governance. Incrementally, day-by-day, month-by-month, year-by-year, and decade -by-decade, the United States has been, and is now moving fast to a communist form of governance. The ground-work has been laid for the last several generations for a complete take over by a communist government where many will not even know it happened, nor care, because the state has been so supportive of government largesse in the form of free goods and services. Believers have lost the culture war. All the while much of the populace was lulled to sleep with bread and circus. The circus being entertainment, and the bread, easy credit while many boiled to death in water not even knowing how it happened. There are however many believers who understand the grave situation we face. Every day there is something that is carried in the news showing the profound difference of the ideologies in our culture. Then the story is pushed around the net with someone saying, “can you believe this?” There are things happening around us now that were unthinkable years ago. As the country descends into more chaos, the more you will see the bizarre. The bizarre is becoming the norm on a daily basis. When you see Governor Cuomo of New York State on the 46th anniversary of Roe vs. Wade, proudly legitimize infanticide and embedding the law into the State Constitution, you know we have reached a new place. This is not paganism, which is historically isolated to a lesser percent of the population, but we have now reached barbarism on a much wider level. This is a communist agenda. In jubilation of Cuomo’s signature, the State of New York lit up the One World Trade Center and other buildings in New York that night in pink. Government sanctioned death until the day before birth with non-doctors able to perform the abortion is now the law. Few are aware this will lead to the harvesting of baby body parts of the victims in late term abortions. Planned Parenthood has boasted off the record how much money is to be made in sales. Virginia introduced a nearly identical bill the day after New York, but it didn’t pass. If it is a blue state, it has a great chance in the near future. This law promoting infanticide (child sacrifice) will now spread throughout America in state legislatures like wildfire. Next on the docket for New York with all backing of the state is assisted suicide. This is theoretical and practical atheism. The next agenda nationally is for more state sanctioned marijuana sales so the state can fund public pensions. Marijuana is the principal gate-way drug to much more serious addictions. Once you reach the point of generally accepted sin, the more heinous is around the corner. Barbarism and communism are not first cousins, but brother and sister. State sanctioned abortion is Satanism. It is the Baal and Moloch worship which was child sacrifice over 4,000 years ago. Judgment and chastisement await those regions of the United States that have violated the rights of the defenseless unborn. It is historical and scriptural, and arguing otherwise will make you a biblical definition of a fool. God will not be mocked. 1. Who is Your Authority is the basic issue confronting man, and it is not a new thought. Satan said, ‘I will not serve.” This is the first disconnect of man from God. Who Do You Serve? You either serve God where you ask for Him to take over and direct the affairs of your life, or you are doing it through your own self-reason. There really is no in between, but many are lukewarm, and we know what the Lord said about those people. Planned Parenthood is the extreme of self-reason unwilling to surrender a will to God. “I’ve gotta be me” is their daily mantra. Until a person surrenders their will to God, they will never find peace of soul. There will always be another “ism” to confront, and an agitation in their spirit. A socialist/communist is always trying to direct the affairs of others to their own world view. Unbelievers seek vindication and acceptance for their sin trying to normalize their behavior through state sanctioned programs. LGBT is just one ideology like this. Many on the left are no longer Christian, they are not believers, they are not democrats, they are not socialists, but they are communists because they want a world without God. That is the difference between socialism and communism. The West is looking more like Rome under the brute emperors before it fell when viewing civility, normalcy, and lack of virtue. We have a controlled propagandized press presenting lewdness and corruption on a daily basis minimizing the good believers are doing. At the senior level it is the cabal of the deep state running the show. The issue is the left is in control of the public relations industry, press, and positions in government. 2. What Exactly is The Role of Government in Our Lives? The daily fight at the food court or café and yes, in nearly every home, is what exactly is the role of government in our lives? Think of the origin of the arguments? Many communists want a cradle to grave approach, no matter the social service and goods from the state distributed evenly EXCEPT for those who portion out them out. In short time, they become a ruling class of their own under totalitarian rules. For them, with unbridled human nature at a lower nature of man, it is about stealing as much as they can for themselves. The state when it reaches the point of not wanting God in any civil matters will go to any means to criminalize Christianity. We are very far advanced in social engineering for several generations where Christian tenets and biblical values will be considered hate speech. Belief in God is the enemy of the State, because it is in direct contrast to their view of the world—accepting sin as normal behavior. It is a stated goal of the United Nations and the elite globalists to bring the Catholic Church into conformity to its agenda of a godless state. Christianity has to be eradicated for communist goals to be implemented under a new international order. When a government continues to give away free goods for votes using immigration to do so, that nation is hanging by a thread for survival. This is the modus operandi of dictators. They appeal to the senses as an inducement for change under their new idealist agenda. Leaders who call themselves Catholics championing godless causes need to be feared as sheep in wolves clothing because they abdicate their first responsibility to God. When elected officials ignore their conscience for the sake of legislating their public responsibilities, they lead the nation to chaos. Words have meaning. As dictators have known, “tell a lie often enough and people will believe it.” Who would have ever thought the LGBTQ and Planned Parenthood agenda could have garnered so much momentum years ago? When the United States Supreme Court removed prayer and the bible from the classroom in 1962/63, did anyone see this coming? Did people speak up? Did the church speak up? Many believers have consented with their silence. What else could the outcome have been? There are now thousands of examples like this in America. Halloween can be celebrated as well as Islam in public venues of all sorts (not just public schools), but not Christian based themes. That is communism. On January 24, 2019, Governor Kate Brown of Oregon stated by the end of 2019 she wants to pass a bill which would require home visits by state officials to all households with newborn babies. This is just another example of government looking to regulate families, and it is communism. Thousands of instances like this could be used to show the extent of state intrusion into the lives of citizens ultimately designed to make the entire family a ward of the state. There are many now in Congress who have never taken a civics lesson, understand the roles of the branches of government, the beauty of the Constitution, and what makes them work — and they could care less. They are anarchists and communists, and they are now the single largest voting block in Congress. Rome in the end was barbaric due to its scope of territory with pagan rituals, and they ruled with grotesque brutality. The Senate of Rome at the time of its downfall had the same pathological makeup as it citizenry. One may see great hope and encouragement that the Lord has a plan, with an agenda for believers to not fall into anxiety or despair. 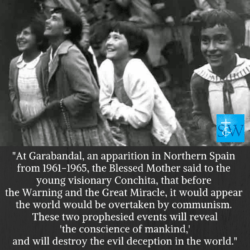 At Garabandal, an apparition in Northern Spain from 1961-1965, the Blessed Mother said to the young visionary Conchita, that before the Warning and the Great Miracle, it would appear the world would be overtaken by communism. These two prophesied events will reveal “the conscience of mankind,” and will destroy the evil deception in the world. The veil will be lifted from our eyes. That is heaven’s promise, and we wait in joyful hope.